Grimpen Mire. Local three piece band comprising Jim on guitar and vocals, Paul on bass and vocals, and Ian on drums. Good to meet you all and thanks for the setlist and CD (I'll do the review soon!). 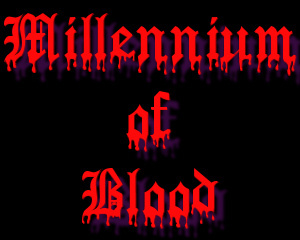 Curiously their MySpace site lists them as metal/black metal/rock. Think they're trying to be ironic! Doom/stoner would be far more accurate. Admittedly their music does exhibit a more extreme side than most, but the vast majority of their set was well played monolithic doom. Great guitar tone, with well-controlled feedback for effect. Solid unit all round, skullcrushingly heavy throughout. Played all the songs off the demo plus one addition. Full setlist was Blood Of My Gods, The Rats In The Walls, Black Saturnalia, Through Leaden Sky and Fore Doomed. Quality start to the evening and genuinely looking forward to reviewving the demo soon. If you like viciously heavy doom check these guys out! Scythian were the only band on the bill that I'd seen before (at last year's thrash all dayer). Have to say I wasn't that impressed with that performance, although I understand this was one of their first gigs. They have improved beyond all recognition. Let's start with band introductions. S Vrath plays bass and screams the vocals (thank you for taking the time to hand write a setlist - appreciate it fella!). The songwriting team of A Satyrus on guitar and J C Volgard on drums complete the lineup. Again thanks for the CD - this will also get the full Chop reviewing treatment soon. Played all the songs off the demo (with the exception of the Bathory cover) plus another couple of songs for good measure. Their timing was a lot different tonight. Essentially they've gone from being an all out thrash/black metal band and now mix a lot more different styles to devastating effect. Blade started the onslaught, followed by Astral Assassins, Shattered Idols, Pray To War, Spires To Ashes, Open Steppe, with the title track of the CD Suffering To The Conquered completing the carnage. Great to see an old school extreme drummer, using the pedals for effect and not constantly blasting, concentrating on battering the living daylights out of the top end of the kit. Awesome drumming display. Chatting to the guitarist shortly after the set revealed that they have recruited a second guitarist - they will be truly murderous when he has settled in. One to keep an eye on - keep improving at this rate and they could become serious contenders. Grave Miasma were up next and playing their first gig outside of London. Thanks to the bass player Adam for again taking the time to hand write a setlist (amazing what a pint of Guinness can do as a bribe!). Relentless onslaught is the only phrase that springs to mind when trying to sum up their set. Basically they unleashed a furious display of precision blackened thrash/death metal which brought back memories of Impaled's set recently. No let up at all, utterly brutal. Can't really say much more other than go and see them - you won't be disappointed. First pit activity of the night, furious headbanging throughout - and that was just from me!! Quality band they deserve to do well. Setlist tonight was This Tomb Is My Altar, ObscureTerror, Gnosis Of The Summon, Glorification of The Impure, Kussa'n Tibtihn (probably completely wrong - sorry!! Hope I'm close! ), Pillars and Apocalyptic Ruins Of Unlight. Over from Sweden and undertaking a UK tour, Terrorama were equally as vicious as Grave Miasma. Their MySpace site lists them as thrash/death but they too include elements of black metal. Another punishing set, made to look effortless by a very tight band. Frenzied pit activity and more serious headbanging throughout - oh that's me again!! Joking aside this was a riotous performance. Managed to salvage a soggy setlist from just in front of the drumkit, which revealed that tonight's offerings were Omnipotence, Perversion Extol, Inseminated With Scorn, Stigmatized Within, Enlightenment Through Death, Archaic Visions, The Orthodox Flame, Immaculate Genocide with Terrorama bringing the evening to a close. Grimpen Mire played a blinder and got the evening off to a flying start. The un-initiated would definitely not have been prepared for the carnage that followed, three sets of immense brutality all delivered stunningly. Impossible to separate the bands for the Chop "band of the night" award. The Reanimator crew served up yet another superb bill - thanks to all involved for putting on such an entertaining gig! !